The Architecture & Design Film Festival (ADFF), returns to downtown LA at the Los Angeles Theater March 13-16, 2019 and WestEdge is proud to be an ADFF partner! Founded in 2009, the Architecture & Design Film Festival celebrates the creative spirit that drives architecture and design, and will screen 33 films from 12 countries with many Q&A’s and panel discussions. ADFF:LA will run in downtown at the Los Angeles Theatre Center, and welcome thousands of guests, all passionate about architecture and design. The venue’s magnificent marble clad, glass ceiling lobby will be transformed into ADFF’s festival lounge with product displays, networking receptions and other interactive offerings. WestEdge is offering opportunities for our clients to get involved as ADFF sponsors and partners. To see the ADFF partnership deck, CLICK HERE. We’ll see you this coming March in Downtown LA! 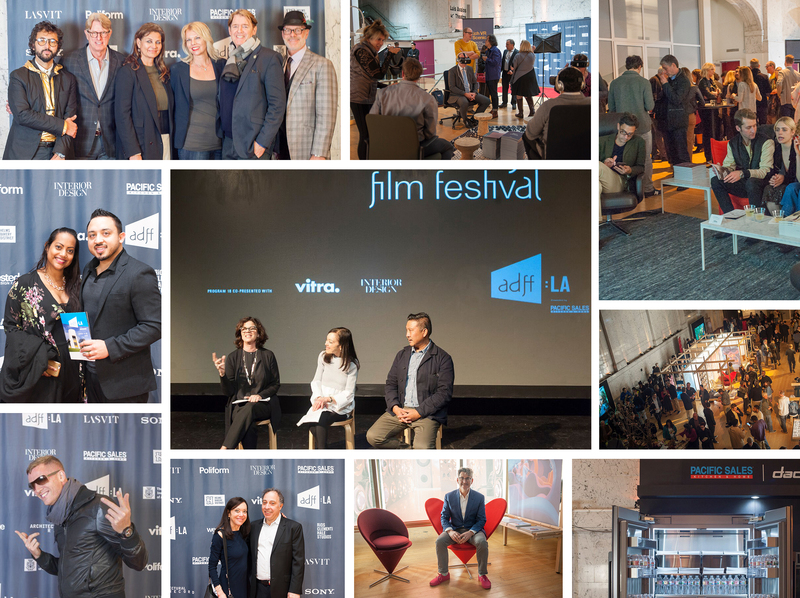 Share the post "ADFF LA Returns March 13-16, 2019"
Flights are booked, Accommodations sorted, and the daily additions to our agenda have begun! The annual, week-long affair, is the decorating world’s equivalent to Fashion Week. Paris Deco Off offers an endless array of interior design trade showrooms, pop-ups, and exhibitions fling open their doors to celebrate their newest collections of textiles, carpets, lighting, and furniture. Coupled with MAISON&OBJET (January 18-22) and it’s 8 halls of design objects, furnishings and accessories for the home, it’s a truly inspiring way to kick off the New Year in the City of Lights. 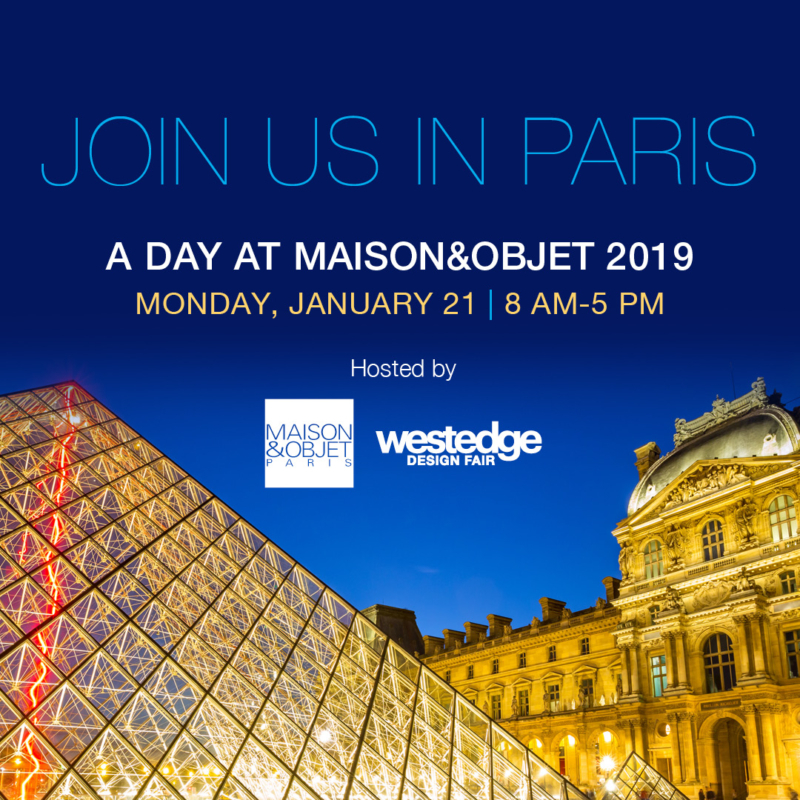 Last year we hosted a group of American designers with a VIP experience to MAISON&OBJET and we’ve partnered with our M&O friends again to host a day-long excursion to the fair on Monday, January 21. The day is complimentary for guests as part of our VIP program and you can see details HERE. Space is limited so hop aboard and plan to join us by RSVP’ing to Megan@WestEdgeDesignFair.com. 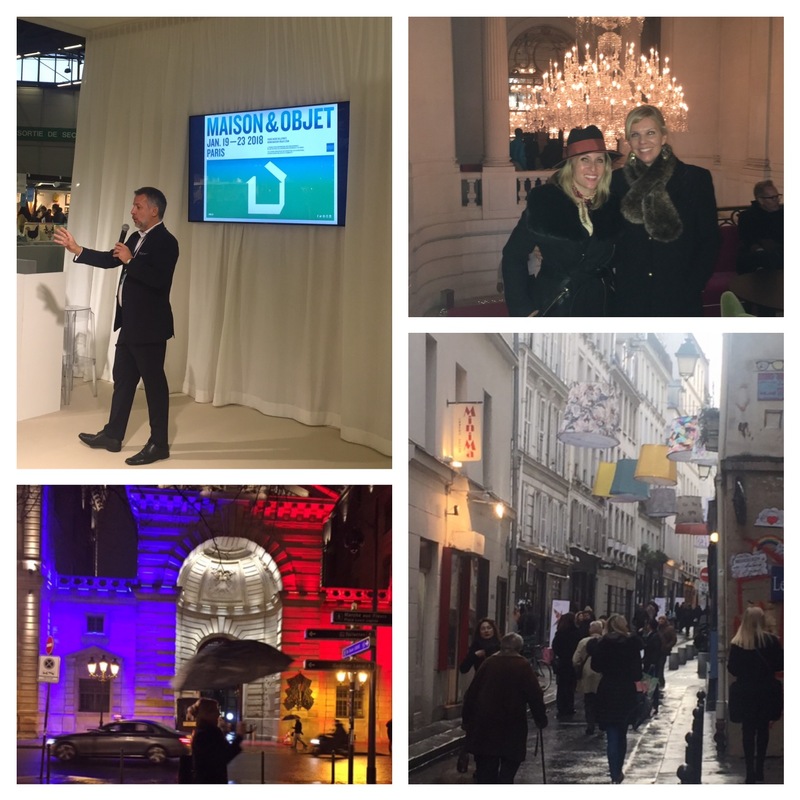 There is no shortage of events, parties and ways to connect with the American and global design communities while in Paris. We are working with Kneedler Fauchere to stay up to date on all the great happenings taking place. Kneedler Fauchere has been building community and promoting the January events for several years now, and each year seems to attract more and more of our American friends making the trip. Check out the KF website HERE for a list of events so far, including their welcome reception on January 16 and the highly anticipated American Party in Paris party which takes place on Friday, January 18. Get tickets for that HERE. So many reasons to join us in Paris! And we haven’t even touched on the museums, patisseries and shopping (annual January sales, Mais Oui)… Stay tuned for more as we plan for the trip. Share the post "Paris Calling this January"
WestEdge is pleased to be a partner of Saatchi Art’s THE OTHER ART FAIR LOS ANGELES which opens this evening and runs through Sunday at the Barker Hangar in Santa Monica. We’re just off the heels of WestEdge but looking forward to taking in The Other Art Fair as visitors this weekend. The event highlights include an immersive installation by guest artist Gary Baseman and special all-female art exhibition “31 Women” curated by Soho House’s Kate Bryan. Saatchi Art’s The Other Art Fair, a leading international art fair championing emerging and independent contemporary artists, returns October 25-28 at the Santa Monica Barker Hangar, where 130 artists from around the world will showcase their works alongside exclusive new artwork by Guest Artist Gary Baseman and a special all-women exhibition entitled 31 Women. 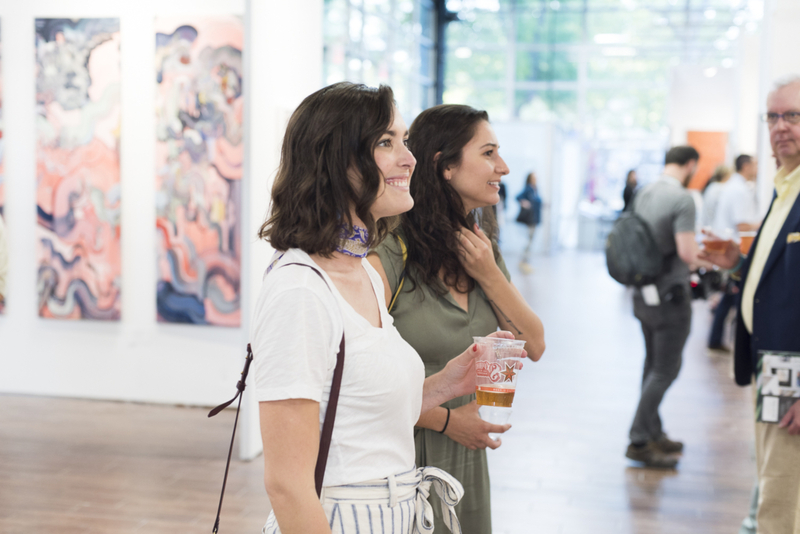 “The Other Art Fair is non-elitist, fun, democratic and fosters a genuine connection between the public and the artists exhibiting,” said Kate Bryan, arts broadcaster and global Head of Collections for Soho House. The Other Art Fair Los Angeles will open on Thursday, October 25 with a Private View sponsored by MINI USA. Proceeds from the Private View ticket sales will support ProjectArt, The Other Art Fair Los Angeles’ official non-profit partner, an organization that transforms the nation’s public libraries into vital cultural hubs by offering year-round visual art classes for youth and providing studio spaces for emerging visual artists. The Saatchi Art Talks Program, led by Saatchi Art’s Chief Curator and Selection Committee member Rebecca Wilson, is an engaging speaker series where artists, collectors and cultural influencers will gather to discuss a range of topics relating to the emerging art scene. To learn more about The Other Art Fair Los Angeles visit la.theotherartfair.com. Purchase tickets for the Los Angeles fair here. with the online promo code WESTEDGE. 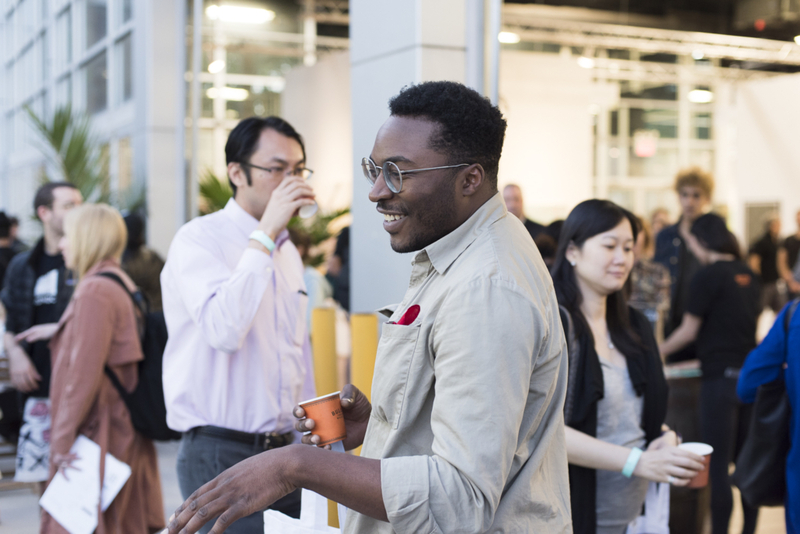 Share the post "The Other Art Fair LA- October 25-28"
Old luxury is dead, and the new modern luxe consumer killed it. 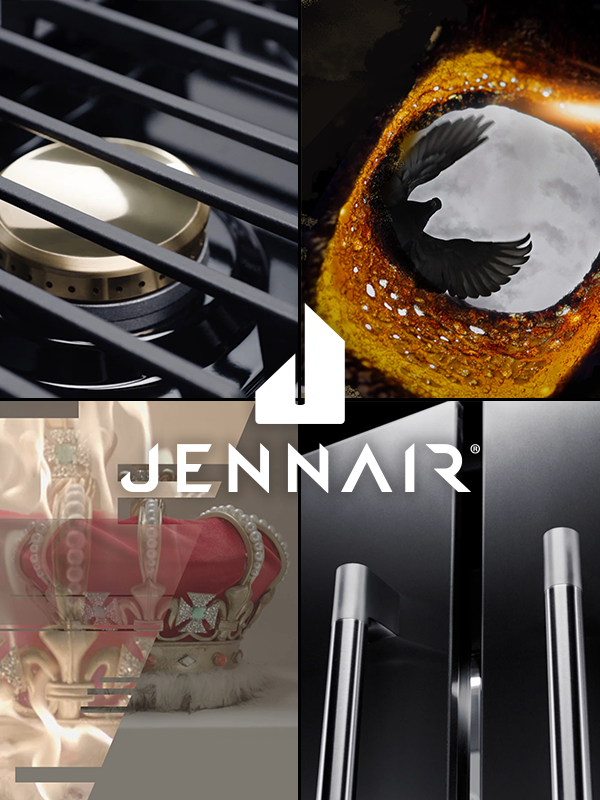 From the ashes, a new expression of luxury is born — brought to life by JennAir. Under a reimagined brand ethos, Bound By Nothing™, JennAir challenges the status quo and, in turn, the entire industry to reimagine a limitless world of design. This past March, JennAir revealed the new campaign and introduced RISE™ and NOIR™, two new defiant design expressions with distinct, divergent attitudes. Seizing the throne, tastemakers and media alike celebrated RISE for its beauty and power, while the mysterious NOIR was showcased only to select influencers. At WestEdge, JennAir continues to peel back the layers of the Bound By Nothing creative expression, showcasing RISE™ and NOIR™ together for the first time. These new offerings, alongside industry-exclusive pieces and an enhanced digital ecosystem that cuts across the entire line of products, showcase the brand’s disruptive design, unparalleled quality, impeccable performance and frictionless connectivity. JennAir is here to satisfy what the new luxury consumer craves and demands: genuine personal style and bespoke experiences in the home. We beckon you to see them at their WestEdge booth and VIP party as they shatter the norm and light up an appliance revolution. Share the post "JennAir Returns to WestEdge, Bound By Nothing"
We’re pleased to announce our partnership with Knoll and LALA Magazine to auction 15 one-of-a-kind Bertoia chairs during the 2018 WestEdge Design Fair with all proceeds from the auction benefiting Safe Place for Youth (SPY). For the partnership titled “Take a Seat”, WestEdge, Knoll and LALA Magazine invited 15 leading architects, designers and tastemakers to create one-of-a-kind art pieces using the brand’s iconic, and recently reissued, Knoll Bertoia Molded Shell Chair as a canvas. These pieces will be unveiled during the fair’s Opening Night Party on October 18th, at the Barker Hangar, 3021 Airport Avenue, in Santa Monica, CA. “Safe Place for Youth is a community-based organization that aids homeless youth and we’re pleased to support their cause and help build awareness. “We are so thrilled to have Knoll and LALA Magazine helping this effort and are confident that the Knoll auction will be well supported by our audience, thereby helping to generate such crucial funds for SPY members,” states Megan Reilly, Co-Founder and Principal of WestEdge. Participating artists, architects and designers include: Cesar Giraldo, Gensler, Shimoda Design Group, Ruben Rojas, Terry Crews, Safe Place for Youth (SPY), Timothy Yarger Fine Art, Hanson LA, Erinn Valencich, Tracy Hiner (Black Crow Studios) and Doug Schwartz (DETROITWICK) for The Caliber Foundation, Art Center College, Katrien Van Der Schueren, Clair Vanders, Nolen Niu, and Carrie Livingston. The auction, benefiting Safe Place for Youth (SPY), will begin during WestEdge’s Opening Night Gala on October 18 and end on October 21, 2018. Guests and design enthusiasts can submit their bids at http://www.safeplaceforyouth.org/. 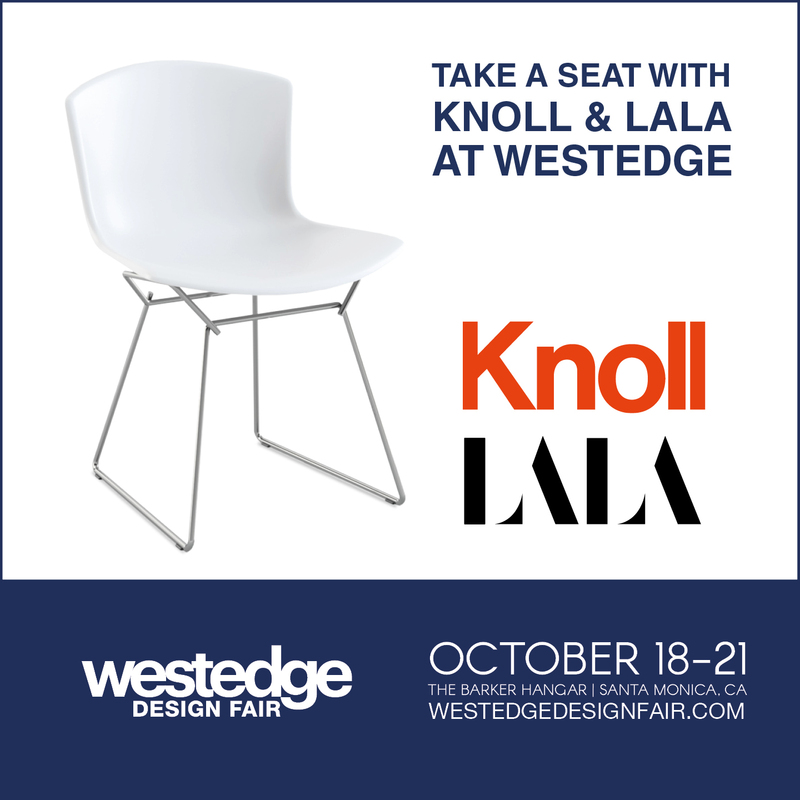 Share the post "Take a Seat with Knoll & LALA at WestEdge"
This seaside cocktail party and private dinner will be an exciting social event filled with surprises in support of Architectural Preservation. 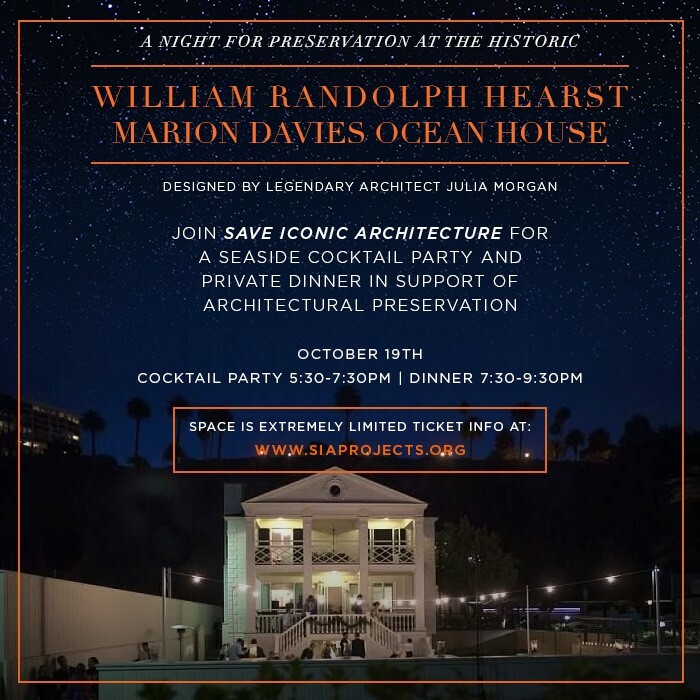 Join Save Iconic Architecture (SIA) for an evening under the stars with Los Angeles’ design society. SIA Projects, is a non-profit foundation founded by Jaime Rummerfield and Ron Woodson. Together with a dedicated group of designers, architects and builders all passionate about architectural and cultural preservation and awareness, they spearhead special properties to protect, preserve, educate, and celebrate. Share the post "SIA Presents A Night for Preservation Friday, October 19"
Share the post "The AD Film Festival Comes to LA March 14-18"
Our 2018 is off to a busy start as we prepare to visit the City of Lights for a week of design happenings, including Maison & Objet, Paris Deco Off and various partner events throughout one of our all-time favorite cities. And, we’re excited to partner with Maison & Objet to offer a “Day at M&O” exclusively for our American design friends making the trip later this month. If you’d like to join us for this VIP tour on Jan. 22, complete with complimentary access, prearranged shuttle service and welcome reception, please email Megan@WestEdgeDesignFair.com ASAP to reserve your spot (space is limited). We’ve also aligned with several of our L.A. design friends and showrooms who’ll be in Paris hosting their own events and taking in all the Paris design-scene happenings. Here’s a look at a few things on our agenda while there. The pre-Paris fun kicks off this week in L.A. with tonight’s ‘Pre-Paris Party’ hosted by Kneedler Fauchere, Thomas Lavin and The Rug Company, followed by a Pacific Design Center “Paris Preview” seminar Tuesday, Jan. 9. So give us a shout if you’ll be in Paris for Maison & Objet. We would love to see you there! Share the post "Join Us In Paris"
Share the post "Art of Travel Auction- Own a One-of-a-kind Samsonite Piece"
We are thrilled to host the launch of the first DesignLIVE L.A. presented by California Home + Design on October 19, 2017. Join California Home + Design‘s Editorial Director Lindsey Shook as she explores a range of topics with leaders of the Los Angeles design community. Join Lindsey Shook, Editorial Director of California Home+Design, and a group of real estate, design, development and art experts as they explore what brings the most value to a home. From Kitchen design to the finest finishes and a dynamic art collection, they will uncover how to get the most bang for the buck. Designing a healthy, eco-friendly home is becoming more and more important. With the new WELL building standards and an ever-evolving collection of eco-materials, it can be difficult to navigate the smartest choices. Lindsey Shook, Editorial Director of California Home+Design, will explore the future of sustainability in the home with a panel of experts. In the current world of design, locally made objects and furniture are playing a central role in the home. California Home+Design’s Editorial Director Lindsey Shook, will sit down with a panel of L.A.’s most innovative makers as they share their story, the secrets of their craft and why it’s important to shop for handmade, local design. Meet California Home + Design‘s Southern California editors during a delightful rose reception! 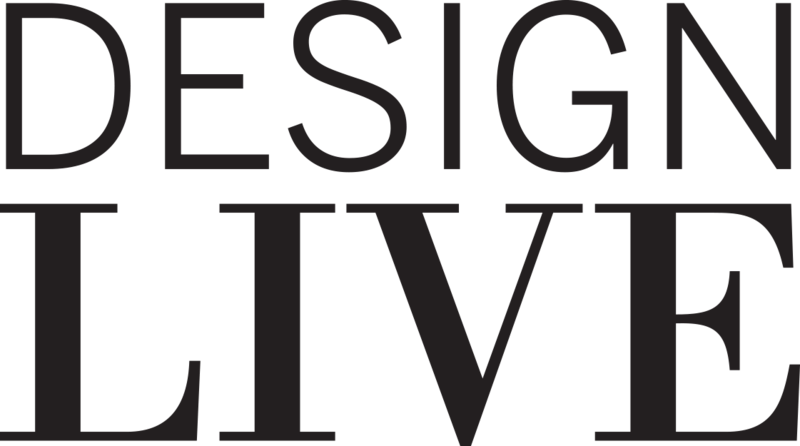 REGISTER FOR designLIVE L.A. HERE! 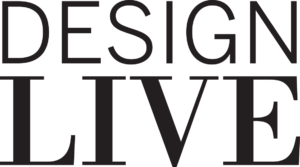 Share the post "California Home + Design Launches DesignLIVE L.A. at WestEdge October 19"